The Manzanares is a river that begins flowing in the Sierra de Guadarrama, a mountain range in the center of the Iberian Peninsula. Flowing southeast from its source, the Manzanares enters the city of Madrid via the El Pardo barrio. The river eventually empties into the Jarama, east of Madrid; the Jarama, in turn, empties into the Tagus on the Spanish-Portuguese border, and the water carried by the Tagus flows into the Atlantic Ocean near Lisbon, Portugal. On the banks of the Manzanares in Madrid, you’ll find the Estadio Vicente Calderón. Opened in 1966, it is home to the city’s best football club. The Vicente Calderón (situated 15 minutes from the stadium that serves as home to the city’s second-best football club) is home to Atlético Madrid, a side that has quietly established itself as one of the top football clubs in all of Europe. The Atlético renaissance began in earnest on 4 July 2007. That day, the transfer of captain and club icon Fernando Torres to Liverpool F.C. was completed. Shortly thereafter, los rojiblancos (“the red-and-whites,” a nickname derived from the club’s traditional home shirt) replaced him with Villarreal forward and Uruguay international Diego Forlan, and that acquisition proved crucial for Atleti. Forlan and young Argentine striker Sergio Agüero combined for 50 goals across all competitions in 2007-08, leading the club to a fourth place finish in La Liga, which in turn led to Champions League qualification for the first time in over a decade. The 2008-09 campaign brought more success; the club made the last 16 in Champions League and once again finished fourth in La Liga after a managerial change in February. Forlan won the Pichichi and the European Golden Shoe that season, as he notched 32 goals in 33 league appearances. The 2009-10 season started off poorly for Atleti, and after a 4-0 thrashing at the hands of Chelsea in a Champions League group stage match on 21 October, the club made another managerial change, replacing former club goalkeeper Abel Resino with former Real Madrid right back Quique Flores. Flores was unable to reverse the club’s Champions League and La Liga fortunes (they finished third in their CL group and ninth in the league), but he was able to guide them to the Europa League title. Forlan scored twice in the final, including the winner in extra time, and the club notched their first European title since 1962 with the 2-1 victory over Fulham. Three months later, Atlético won their first Super Cup with a 2-0 win over Champions League winners Internazionale. After a seventh-place finish in 2010-11, the club sold Agüero and Forlan to Manchester City and Internazionale respectively, and purchased Porto sniper Radamel Falcao. Diego Simeone, a member of the 1995-96 La Liga winning team, was named manager on 23 December 2011, and Atleti rode the deadly Falcao to Europa League glory for the second time in three years. In an all- Spanish final on the ninth of May, Falcao recorded a brace in a 3-0 win over Athletic Bilbao. On 31 August, los rojiblancos captured another Super Cup by virtue of a first-half Falcao hat trick in a 4-1 throttling of Chelsea. In the 2012-13 La Liga season, Atlético Madrid placed third–their highest first division finish since they won the league 17 years earlier. They clinched a Champions League berth by virtue of this finish, but perhaps the most important part of their season came when they defeated their city rivals for the first time since 1999…at the Santiago Bernabeú…in the Copa del Rey final. The thrilling 2-1 extra-time victory on 17 May gave Atleti their third trophy since May 2012 and their 10th Copa. Fast-forward to today. Atlético are second in La Liga. They are even with leaders Barcelona on wins (15) and points (46), and are two behind the table-toppers in goal difference, 37-35. Barca are second in Europe in goal difference, and Atlético are third. They currently enjoy a 14-match unbeaten streak across all competitions; they’ve returned to the Round of 16 in the Copa del Rey and steamrolled through their Champions League group (winning five of six matches and compiling a +12 goal difference) en route to a tie with A.C. Milan in that Round of 16. A major concern for Atlético Madrid heading into the season was how their attack would fare in the aftermath of Falcao’s big-money move to Monaco. The answer: quite well. 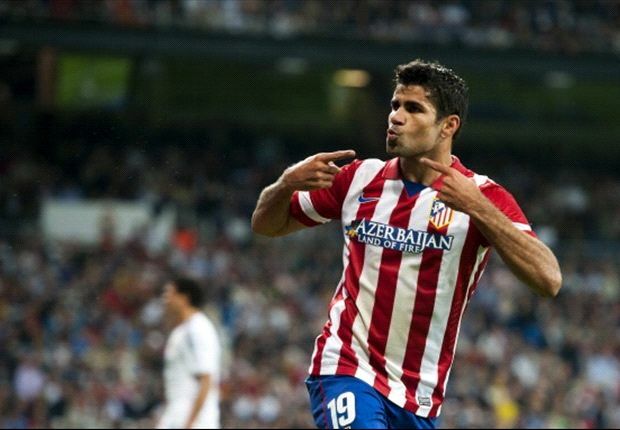 Led by talisman Diego Costa, Atleti are third in La Liga with 46 goals and are on pace to score 103 times. The summer acquisition of Barca and Spain striker David Villa has paid off nicely for the red and white; the 32 year-old has eight league goals to his name this season. Midfielder Raúl García has six goals in La Liga, and the 27 year-old Spaniard has a further three in Champions League–one behind Costa for the club lead. Koke, a young midfield wizard and Spanish international, has an 82.5% pass-success percentage, and his total of eight assists ranks second in La Liga. Even Gabi, a defensive-minded midfielder who is known more for his tackling prowess than his contributions to his team’s attack, has five assists. But the center of the attack is undoubtedly the explosive Diego Costa. The Brazilian played second fiddle to Falcao during the Colombian’s tenure at the Vicente Calderón, and he has made the most of his opportunity as Atlético’s leading man this term. Costa is a capable scorer with both his left and right foot, but he prefers his right, as 12 of his league-leading 19 league goals have come via that foot (six have come via his left). A lethal finisher, his 39% chance conversion rate is the highest of any player playing in the “big five” European leagues. Costa’s form has been such that his manager believes he could have been a Ballon d’Or candidate this year. Diego Simeone usually runs a 4-4-2, and there aren’t many qualms with the formation; Atleti are averaging nearly three goals per match, and nearly four per home match. They very rarely work in their own half, and due to this, they are La Liga’s third-most active team in the opposing half. Atlético prefer to work from the left side (39% of the time, third in the league), but 66% of their attempts are from the middle of the pitch. This is because of the tendency of their attackers (mostly Koke) to cross. Atleti lead the league in shots from within 18 yards; 63% of their chances come from there. 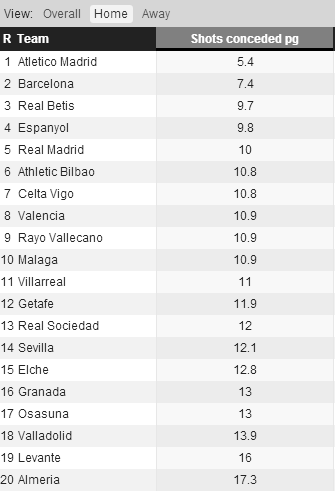 In contrast, only 26% of their attempts are from outside the box, the lowest percentage of any La Liga side by 10%. Overall, this attack generates 14.7 shots per match, the third-highest average in the league, behind only Real Madrid and Barcelona. For the sake of comparison: in 2012-13, Atlético generated 13.4 shots (4.9 on target) per game; in 2013-14, with no Falcao, Atlético are averaging 14.7 shots per game, 6.7 of which are on goal. Los rojiblancos can score in a variety of ways; they are third in La Liga with 27 goals in open play, their six goals on the counter-attack rank second in the league, their six tallies off set-pieces are tied for sixth, and their five goals from the spot (four from Costa, one from Villa) bring them level with Barca and Real for the league lead. In Madrid, the team’s plans center on the attack; they are in possession of the ball 54.6% of the time on their home pitch, and they focus on bludgeoning opponents with a barrage of crosses, through balls, and Costa goals. But away from Madrid, their possession percentage falls to 41.8%; to compensate, they turn up the defense. Atlético average 28.5 tackles per contest away from the Calderón, an average more than two tackles higher than the next closest team. And despite conceding nearly 13 shots per game away (still the sixth-lowest average in La Liga), the club has conceded only five goals in eight away matches this season, the lowest total in the league. There are three players in particular who are critical to the club’s stout defense: Diego Godín, João Miranda, and Gabi. Uruguay international Godín is an essential part of the defense; the centre-back is one of the best defenders in Spain, if not all of Europe. The 27 year-old averages better than three interceptions and seven clearances per contest, throwing in about two tackles as well. You know, just for good measure. Miranda, who scored the Copa-clinching goal in May, joins Godín as centre-back. The 29 year-old Brazilian also contributes across the board, averaging three tackles per contest to go along with 1.4 interceptions and 6.4 clearances per game. Gabi was mentioned earlier for his contributions to Atleti’s attack, but the 30 year-old Spanish midfielder is also the club’s best tackler. He has accrued 72 tackles over 17 league games–an average of 4.2 per match. This average is 0.1 tackles behind right-back Filipe Luis for the club lead. Again, while Atleti’s splendid attack is certainly deserving of effusive praise, their defending is their hallmark. Tough defending is what wins the big games. Atlético’s overall dominance can be further quantified by the use of two advanced statistics: PDO (an abbreviation with no discernible meaning) and total shot rate, or TSR. PDO, a statistic appropriated from hockey, is the total derived from adding a club’s scoring percentage to its save percentage and multiplying by 1,000. Atlético Madrid have accrued 113 shots on target in league play thus far, scoring on 44 of said shots (the two own goals they’ve conceded don’t apply here), good for a 38.9% conversion rate. At the other end of the pitch, Thibaut Courtois has faced 40 shots, stopping 29 of them, a 72.5% success rate. Adding those two percentages and multiplying by 1,000 means Atlético Madrid’s PDO is an exceptional 1,114.4. 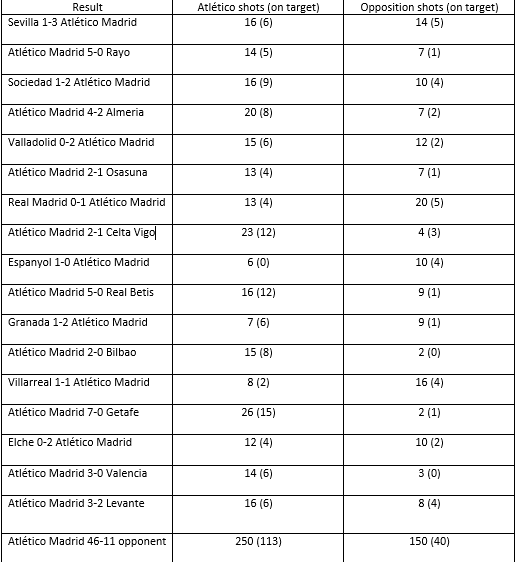 In this case, take 250 (Atlético’s shot total) and divide it by the sum of 250+150 (400). When this process is complete, we see that Atlético Madrid’s TSR is an excellent 0.63. Atleti scored 15 goals on 37 shots on target in the group stage, while conceding three goals on 17 shots on target. This is good for a 1,228.9 PDO. As for TSR, they conceded nearly three more shots per game in group play than they have to this point league play, which means a lower TSR. Atleti’s group stage TSR was 0.55, which is still pretty good. Now, what does the future hold for the red and white? The club is in contention for a treble, as they are second in La Liga and participating in the Round of 16 in both the Copa del Rey and Champions League. Considering their devastating domestic form, it’s certainly not out of the question that they can win another Spanish trophy. As they are firmly entrenched in the La Liga title conversation at the moment, the two fixtures against Barca in 2014 could go a long way towards determining the La Liga champion. Atlético are the defending Copa Del Rey champions, and that tournament resumes on the seventh of January, as they kick off a two-legged tie in Valencia with 11th-place hosts. Assuming they dispatch Valencia and the winner of the Betis/Bilbao tie, they could face Real in a Copa semifinal. And last, but not least: as mentioned earlier, Milan are Atlético’s opponents in the Champions League Round of 16, with the first leg of that tie taking place at the San Siro on 19 February. The seven-time European champions have struggled mightily in Serie A this season and barely qualified for the knockout phase. It’s difficult to say just how far Atlético Madrid can go this Champions League season, but should they dispose of the rossoneri, we’ll know more about their chances after the quarterfinal draw takes place. 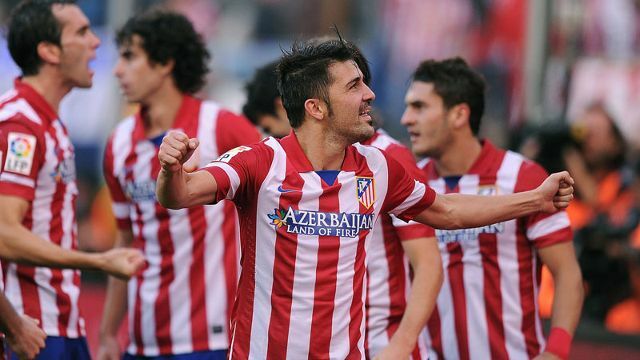 Overall, Atleti appear to be in great shape through May 2014. After next May, however, changes could come to the Calderón. First, there is a good chance that Jose Mourinho will finally bring Thibaut Courtois to Stamford Bridge in the summer to either back up or replace the incumbent Petr Čech, despite the 21 year-old’s insistence that he is happy in Spain and despite his desire to be a #1 keeper. The potential loss of Courtois could be mitigated by the successful return of Sergio Asenjo, but the former Spain Under-21 goalkeeper has a cloudy health record and may be purchased by Villarreal, the team he has been loaned to, at season’s end. Another potential departure comes in the form of Koke. Atlético may decide (or may have already decided) that the time is right to cash in on the young and supremely talented midfielder, even though his contract was extended through 2018 in September. Manchester United are known to be keen on the 21 year-old, and depending on how strongly you believe the tabloids, a move could happen in January. While the loss of Courtois would certainly be a negative, and the transfer of Koke would require midfield reinforcements to arrive in Madrid in short order, the departure of Diego Costa would, on paper, be the biggest blow. Costa agreed a new deal in August after Liverpool’s interest in the Brazilian was revealed, but his spectacular form has led to speculation that should an Arsenal or a Chelsea activate his release clause next summer, Atleti would cash in on the Pichichi front-runner. Of course, a potential Costa sale would not be the first time Atlético Madrid have sold off a striker at the peak of his powers; Fernando Torres, Diego Forlan, Sergio Agüero, and Radamel Falcao have all been sold over the last six years, and the club has managed to field better teams in the wake of each sale. There’s no reason to think they can’t recover at least somewhat from the sting of a Costa sale. Adequately replacing the Courtois/Koke/Costa trio, however, will take some work. But the club’s fans shouldn’t have to worry about all that just yet, and neither should fans of Spanish football or football in general. Atlético Madrid are among the best sides in Europe, and those lads playing on the banks of the Manzanares are worth watching. This entry was posted in Analytics, La Liga and tagged Arsenal, Atlético Madrid, barcelona, Chelsea, Falcao, Fulham, La Liga, Liverpool, Manchester City, Manchester United, Monaco, PDO, real madrid, TSR. Bookmark the permalink.